Using RescueTime to track the time you spend on your Chromebook is possible. It involves a few more steps than getting set up on other operating systems. 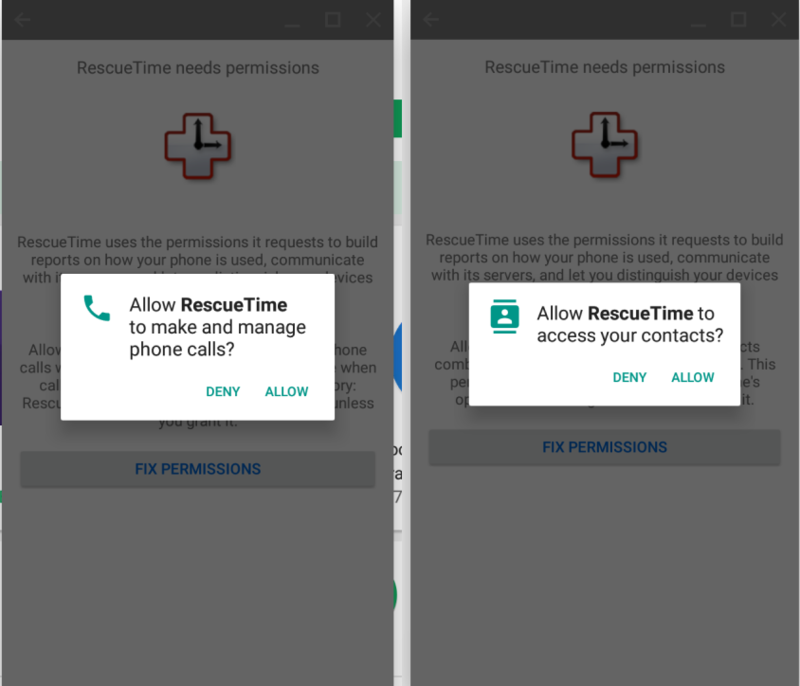 To get the complete feature set*, you need to install both the RescueTime Android app and the Chrome browser extension, then configure both to work together seamlessly. The whole process should take no more than five minutes, and once everything is set up, you should have a reliable application and website logging on your Chromebook. Note: FocusTime is currently not supported on ChromeOS. You can install and run Android apps on nearly all recent Chromebooks. 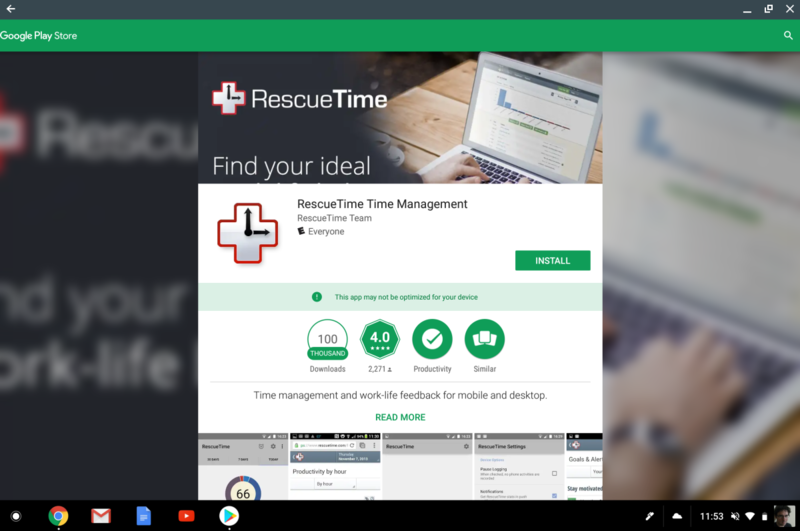 You can find the RescueTime Desktop application in the Google Play Store. Install and open the RescueTime app. The first time you open the App you will be prompted to grant a few permissions. All permissions are currently required to track apps correctly. First, you will need to give RescueTime access to your app usage statistics, which is where it reads the time you have spent with each application. You just need to click Fix settings then set "Permit usage access" to On. You will then be asked to allow RescueTime to access and make phone calls. You will then be asked to allow RescueTime to access your contacts. In the current version of the Android app, both phone calls and contact permissions are necessary to record app usage. This may change in an upcoming version. The RescueTime application does not make calls, record calls, or record your contacts. When you are done setting permissions, you will see the screen to create an account or log in. Click the Already have an account? Sign in link in the top right corner and sign in to the app. When you see a screen that says "Waiting for new data from your computer" you are done with Android configuration. You can log time in web-based applications using the RescueTime Chrome Extension. You can find the RescueTime Chrome Extension in the Chrome Web Store. Install and open the extension by clicking on the icon in your Chrome browser toolbar. You will need to sign into RescueTime. Click the I already have an account tab and enter your email address. Important step: Before signing in, make sure the checkbox labeled I'm already using the full RescueTime application on this computer is not checked. This will let the extension log time spent in the web browser, which cannot be read by the Android app. Once you sign in and get redirected to a page that says "You're all set! Your activation is approved", then you are done configuring the RescueTime Chrome Extension. The drawback of logging time through two different apps (RescueTime for Android for apps, RescueTime Chrome extension for websites) is that there is a place where they overlap. This can result in time in the web browser being logged twice. This is an easy thing to fix, however. You just need to tell RescueTime to ignore the time that's getting logged for your browser through the Android app. You can do this by looking in your reports for an entry called 'org.chromium.arc.home'. Tell RescueTime to ignore that and delete any previous time logged, and you should be in good shape. Now the Android app will record all apps except the web browser, and the Chrome extension will record all websites. Note: If you don't want RescueTime to track your mobile activities, as long as you don't log into your RescueTime account with your Android device you won't see any of that information reported.